During the last years, we have talked about the advantages of the digital signature in the insurance, telecommunications, distribution and human resources sectors, among others. However, really how does it work? Do you need to have advanced knowledge to use it? We tell you how can digitally sign a document quickly and easily using the real example of Viafirma solutions. Signing with paper and pen has already been in the past. Digitization has revolutionized many aspects of the industry and many processes have changed radically, making it easier, faster, more efficient and friendlier to the environment. If what you need is simply to sign a pdf, the digital signature process is simple and in just 30 seconds anyone can sign a pdf document thanks to the original Adobe reader. However, there are also other people, especially in the business world, who do need to go further and seek benefit such as security in legal terms and improved productivity. This is found in solutions like Viafirma. At the time of entering into this world of the digital signature, the first thing is to assess which solution we are going to use among all those available in the market. Taking into account that the signature is a matter of great importance, it is not a decision that should be taken lightly, since a security breach could imply many problems for its user. In addition, a digital signature solution must have the ability to provide evidence that gives it legal validity. These evidences are those that guarantee the identity of the user and their connection with the firm, and, therefore, offer guarantees so that it can later be used in the court. Finally, what anyone interested in this type of solution should take into account is what are the functionalities offered or compatible external devices to meet the specific needs of each. After evaluating all these factors before getting any digital signature application, we will see how easy it is to use it using Viafirma as an example and its mobility solution, which allows you to sign any document from your mobile device. The first thing we need is a document that is preferably in pdf format, and that will be the one signed digitally. On it, we can place all the evidence that we want or need, according to the conditions established by our legal department. Photo capture: usually used in cases such as courier, in which a picture of the delivered package is made or when you need to attach other items such as ID, passport or a receipt. Geographical location: GPS is used to fix the location during the signing process. This method is widely used in package deliveries, to ensure that the courier has made the delivery at the indicated address. Official time capture: the exact time at which the signature was produced is placed, backed by a Time Stamping Authority (TSA). Biometric data capture: through certain compatible devices (such as Wacom tablets), it is possible to save certain details of the signature (biometric), such as speed of plotting or pressure. Fingerprint capture: another way to identify the signer is the use of your fingerprint through specific readers or those that are already included in mobile devices. Voice-over capture: the voice is another unique and identifying biometric feature that can be saved as another piece of evidence. In some cases, it is a less complex process that does not need large measures to grant greater legal support. An example of this is the consent of the use of your personal data. All you need is a signature (without needing to be qualified) to complete the acceptance of the terms. In other more complex situations, it is convenient to have a greater number of evidences. In this way, the security of the signed contract increases significantly. Solutions such as Viafirma respond to any level of security. The user decides which level is best suited to their usage scenario and requirements. At this time, it is convenient to remember the types of electronic signature that exist, all contemplated in the legal framework of the eIDAS regulation. Simple electronic signature: It is a set of data in electronic format that are associated in a logical manner with other data, which are used by the signer. Advanced electronic signature: It must be linked only with the signer, it must be done in a system that only the signer can use with a high level of trust and must allow the identification of the changes made in the document after the signature. Qualified electronic signature: In addition to complying with the conditions of the advanced signature, you must include a qualified certificate issued by a trusted provider and must have been performed in a qualified device that guarantees the integrity of the data. In addition to the evidence that we have described above, there is another type of identity verification used in mobile signatures: the signature associated with sending an OTP code (One Time Password) via SMS (OTP SMS), to the phone number of the signer’s mobile, or to the mail (OTP Email). In this way, the identity of the user is confirmed through their connection with the telephone. Spanish legislation guarantees that this process is sufficient for the identification of the individual. This type of validation is very common, especially in banking environments. For example, when making a digital transfer or making a payment in an online store, our entity sends us an SMS with a code to verify that it really is us and there has been no theft or any security breach. It may be that other evidences such as photographic evidence are also needed, for example in the case of a courier company before delivering a package or to attach the ID. Regarding the signature at a distance, in the case of Viafirma the signer does not need to have contracted or installed the solution. We just need to enter your email to receive the form in your e-mail inbox and fill it in from any web browser, either from a computer or from a mobile device. We also have a powerful forms editor. In the event that we do not have all the data of the other party, we simply create a form with what we need so that, it is he who fills it and then they are reflected in the final document. There is also the possibility of saving templates, something especially useful when you have to sign the document with a relatively large periodicity. For example, a salesperson who every time he makes a sale needs the signatory client to quickly access the base form. If the receiver is also a Viafirma customer, you only have to indicate the user to whom we want to send the document to sign and to which device in case it has several registered ones. Once the document is signed, within the pdf file, in the attached elements, you can see all the added evidence and even know the technical details, such as geolocation, stroke pressure, device version, and so on. In addition, the state in which the documents that have been sent to sign can be monitored at any time. In this way, you can know which ones have not been signed yet and insist that the process be completed. You have probably used this system to pay sometime, through which you have to sign on a tablet that records certain technical details, such as the speed of the layout or the pressure exerted. 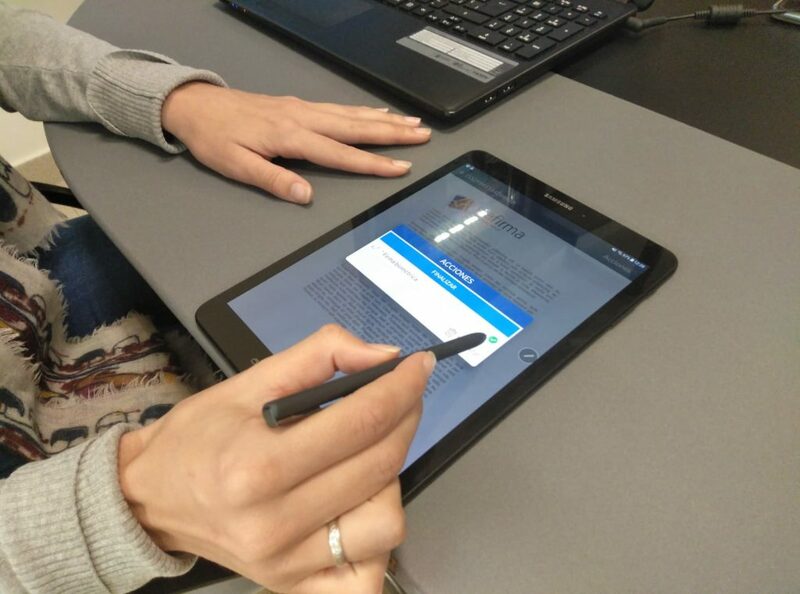 A clear example of the face-to-face digital signature is in the shopping centers. Link in a unique way to the signer and the signed data. Ability to detect any change after signing. Guarantee that only the signer can generate such signature. Security during this process is one of our priorities, so the information captured is never in the hands of the service provider or the software manufacturer. This information is encrypted locally, which can only be accessed with software that can only be used with the order of a judge. While on iOS and Android devices, the application itself performs the encryption through a key of a trusted third party. As we have explained, the digital signature of a document requires only a few minutes of your time. This is something that formerly took a lot more and consumed other resources, such as paper, which means cost savings in several aspects. Following these simple steps, we can sign any document quickly and easily, either in person or remotely. If you want to try it and have any questions, do not hesitate to write us, we will be happy to talk to you!